Great post, what if my dog doesn't jump but dig? Are there ways to prevent him from digging? Hi Melody. Bend that heavy gauge wire so it comes out 6-12 inches away from the fence once it hits the ground and anchor the heavy rebar at the base like the photo shows. It that's still not enough, you may need to pour a short cement base along/under the bottom so your dog just can't get anywhere. Then, think about giving him a spot in the yard where he's 'allowed' to dig and teach him it's okay to use that spot (deep walled sand box, etc) Good luck to you guys! Osa got out once by using the "Z" on the inside of the gate. The gate was built up 2 feet immediately after. I have a GREAT fence guy in the south bay if anyone is interested in any fence work. He has done all of work, and is honest, hardworking, and likes pitties. Let me know if anyone is interested in the San Jose area. I have earned the importance of making sure no one can get IN, either. a gate latch on a chain link fence can be kicked right in. All my gates are secured with a heavy length of chain around the gate posts, and a nice big tamper proof padlock. I also never leave my dogs in the yard when I am not at home, even for ten minutes. I have had a dog stolen, noosed and hoisted right over the fence, while I had run to the store. Luckily he was picked up by animal control months later and returned yay microchip!! Noosed and hoisted over your fence? Holy crap! You must have been out of your mind about this! Thanks for the reality check. And yes - praise be to microchips - and to you for keeping your contact info current on the chip. I've got a coyote mix who just can't ever be outside unsupervised...The little gal is actually part cat! She scales our 6' wood fence like it's nothing. natalie makes a great point about locks on the gates- these guys are great about getting frustrated with not being able to get over/under/through and figuring out how to open the gates. and children/neighbors/roommates who don't know the rules can be that much more dissuaded by locks on the fence. it really does make a difference. Tips! I have some, courtesy of our old mutt who could jump a 6-foot fence without a running start. We used lean-ins, similar to this: http://www.inetdesign.com/wolfdunn/containment/barbarms.html so that he couldn't grab a hold of the top of our 6-foot wooden fence and pull himself over. 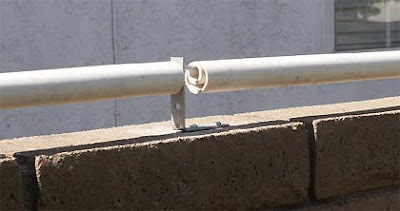 Alternatively, you can get PVC piping and place them along the top of the fence-line so that the dog can't get a good grip onto the top and hoist himself to the other side. As a tale (tail?) of caution, we are still looking for our girl who jumped the foster’s fence (a rental) last Spring. We have had 30 inches of snow since she was last seen, but a group went out and posted fliers last weekend. We have been working with a pet tracker, Sam Connelly, and her wonderful golden retriever, Salsa. 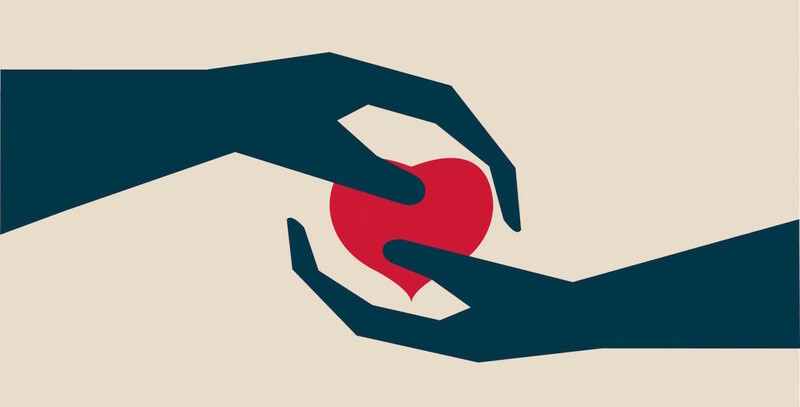 Lots of good information on her site as to what to do to prevent your pet getting lost – see Safeguards you can do today, including take lots of good pictures, and what to do if your pet goes missing. And of course, success stories. Since we started working with her, she has helped locate quite a few dogs and cats. They're nice because they would help keep critters from climbing *in* to the yard,too. For the dogs that like to try to grab onto the top of the stockade fence and hoist themselves over, PVC piping can be adhered to the top. It's harder to get your paws around something that is round and slippery. Agree about Electric Fences...my Lily and my friend's beagle Darwin would take that jolt any day of the week if they saw anything of interest on the other side! The pups look like they enjoy their new fenced in area quite a bit. The shelter where I volunteer won't adopt out to an owner with invisible fences. 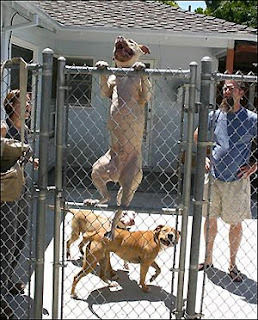 Most feisty dogs will grin and bear the shock to get out, but not to get back in! For my digging dog, I finally put in a concrete footing along the fence line. I picked up (literally) hunks of broken up concrete from a demolition site and lined the base of my fence. However, I still don't leave her unattended in the back yard for fear of some new Houdini act to get out! I find that setting up your dog for success with sturdy escape proof fencing is necessary for safety. But if the dog is consistently trying to escape, there is either an underling behavior problem that needs to be addressed or perhaps the dog's physical and mental needs are not being met. Wow - that's impressive! Bravo Bruno! Great post! Our rescue won't adopt to people who plan to leave their dogs unattended, but even while supervised, pitties are such great athletes and so smart that it only takes a second for them to escape. No need to make it easier on them with broken fences! Luckily he hasn't tried to use those same leg muscles to leap over our 6 foot fence, but knowing he easily could is precisely the reason I don't let him out of my sight when he's outside! Mine don't try to escape but one did accidentally. She was chasing a squirrel up a tree (her favorite pass time). She got about 7ft up or so and jumped down. The only problem was the tree was near the fence and she landed outside the fence line. I saw her go over and I found her panicked leaning up against the fence to get back in. 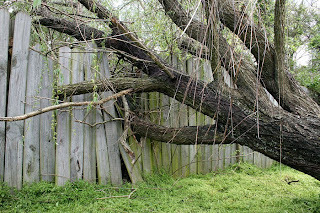 So check to make sure your tree branches aren't hanging over your fences either. Yep - tree branch ladders are classic! A favorite fence story: Once I was in our backyard showing a foster dog to prospective adopters, and explaining why fences were just an inconvenience to some dogs. They nodded, but you never know how much nodding is just posturing. Suddenly as if on cue, our girl Sally - who'd been playing with the neighbor's dog next door - came S-A-I-L-I-N-G over the 6' wood fence like superman in flight, squealing like a lovestruck pig in a happy rush to greet the visitors. She nearly beaned them in the head on her way over. After we jumped out of our skin, we lost our breath laughing, which was fine since I didn't need to talk to make my point anymore. How I wish we had that on video - it was so g-dam funny. Our big issue is keepIng the neighbor's dogs from breaking fence boards to get into our yard. We have reinforced the bottom with 2x4s and will be adding the wire and rebar to ensure our dogs don't try to crawl under any broken areas. Our dogs are social, theirs are dog aggressive and it's been a serious problem. Since they came through the first time and mauled my small dog, he's decided he wants to go under when they crack boards and fight back and my staffy mix is there to back him up. I usually hate overweight dogs, but the neighbor's dogs being so fat keeps them from jumping over. That said, I think coyote bars are going up next to prevent it just in case. How do I convince the neighbor replacing boards as they get broken isn't enough? Our side is turning into a fortress, but what about the other neighbors? 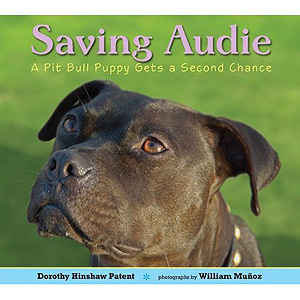 Pitties really don't need any more bad press, and it's just a matter of time before something else happens. Our otherwise perfect little brindle marshmallow, Tozi, has gotten under, over, around, or through every kind of fencing imaginable in pursuit of small game. She recently cannon-balled through a solid board fence to get to the armadillo on the other side. I was less than 15 yards away. We are putting up 6' privacy fence in front of the chain link, but we still never leave her outside unsupervised. She is not very young, not very athletic, but extremely determined. Moral of the story? Where there's a will (or an armadillo), there's a way. I always had a problem with my dog digging out when she was a puppy. She got lost for a week, and it curbed the habit, but I noticed this product called Dig Defense, and it seems to replace cementing, so you don't have to dig anything up. Has anyone used these? The most important thing is to not leave them alone outside. No fence at all can stop a determined escape artist. My pit once chewed through our house wall. Yes, literally through the house -- through the molding, drywall, insulation, and a beam. She was only alone for about 6 hours. If she can do that, then she can chew through the boards of a fence! Two other fencing options: I won a Purrfect Fence at a silent auction which is a fence created to keep cats in and predators out by using angled-in flexible deer-type fencing. 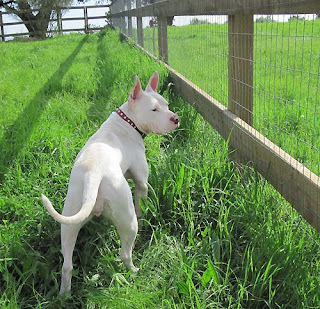 The pitties could chew right through the nylon fencing but we also used 6 foot non-climb horse fencing on the inside. So, once they got to the top of that, the wiggly, flexible nylon that angled into the yard kept them from getting any foothold to go over. Not pretty, but functional and luckily we live on acreage in the county so no one cares that it's not pretty. The second solution we had to use years ago when we did have to leave our pitties outside while we were at work was to bury a complete floor (covered with deep gravel to protect their feet) of welded wire sewn together with wire and also sewn with wire to the kennel panels. It was also covered with sewn welded wire on top and shade cloth on top of that. By sewn, I mean that we used a roll of wire "thread"(think bailing wire, but this was stronger) to completely sew together the pieces of welded wire in and out through each square and to the base of the kennel. They never were able to escape and they were Houdinis. It wasn't ideal, but ideal wasn't possible for us at that time and it was SAFE for them. This is no longer necessary for us, but it definitely worked when we needed it. My son installed the DIY coyote roller (roll bar) on my chain link fence and it works perfectly. A little unsightly but I am growing morning glories to run up the fencing and hopefully cover that PVC pipe! Once my girl gets older and less inclined to jump I'll remove it (we didn't secure into the fencing with screws, but rather used clamps). Love your no nonsense blog!! Does anyone know anything about Pet Playgrounds Fence system? I am considering this type. O.M.G. I'm so excited to see a blog post from Donna!!!! What keeps the dog from digging under the rebar? Funny how one learns stuff. 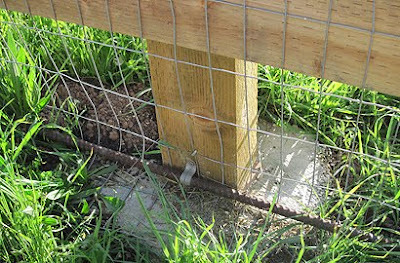 I found how my loose shaky fence was impossible for any (so far) dogs to escape. When they put their paws up on it the shakiness scared them away. My fence with concrete footers was so sturdy they felt comfortable leaping on the top rail and then easily hopping over.